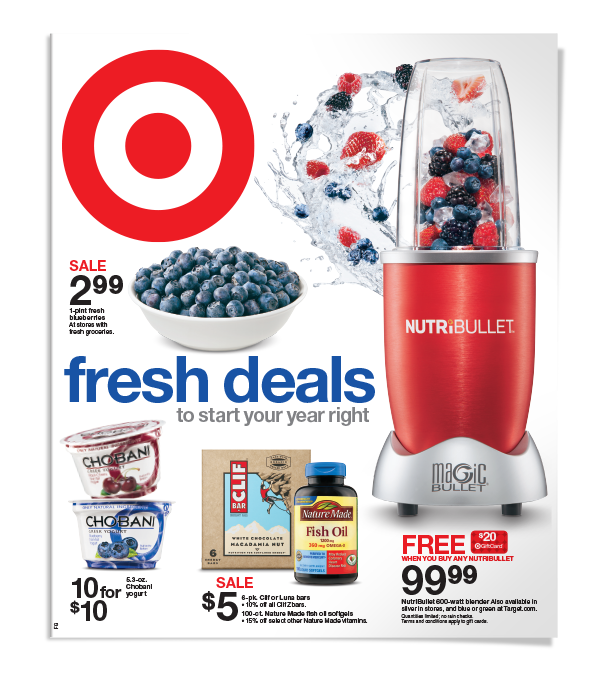 With almost 100 million readers a week, Target’s Weekly Ad is a leading driver of sales for the $70B+ retailer. For over 20 years we have a proven track record for supporting the Weekly Ad team across all merchandise categories, providing new ideas and strategic concepts to keep the ads fresh and consistently yielding measurable results. 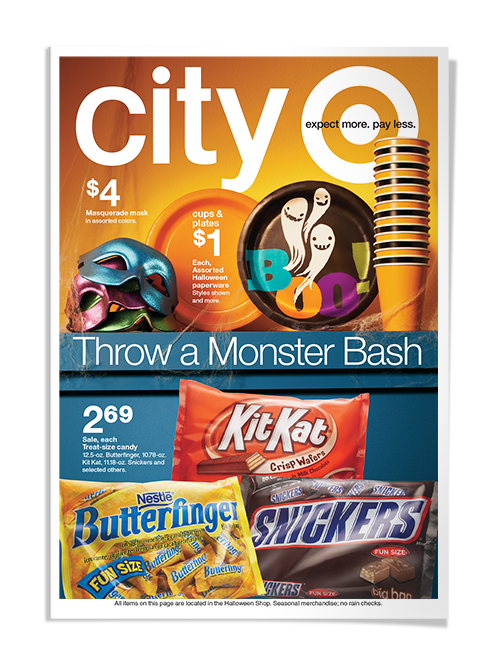 Below is a selection of covers we have conceptualized, designed, and produced—often from start to finish. Back to School, Back to College, Tees & Tanks to RacerBacks. C9, Xhilaration, Merona, Converse, Cherokee. Apparel laydowns to models in yoga poses. We’ve got experience doing it all. Home is in the details. A stack of sheets hit by a dawning sun. Aromatic steam off a fresh-brewed cup of coffee. The subtle hint of a patio table prepped for visitors. Every shot has a story to tell. Fun to play with, difficult to shoot. These products require more dialogue between art director, stylist, photographer, and imaging artist than most any other merchandise category. To set Target apart, we look for the dramatic angle, the close crop or perfect prop. It’s all about elevating the edible. Doesn’t matter if it’s grilled, roasted, fried, baked, toasted, drizzled or brewed, we’ve probably done it before. 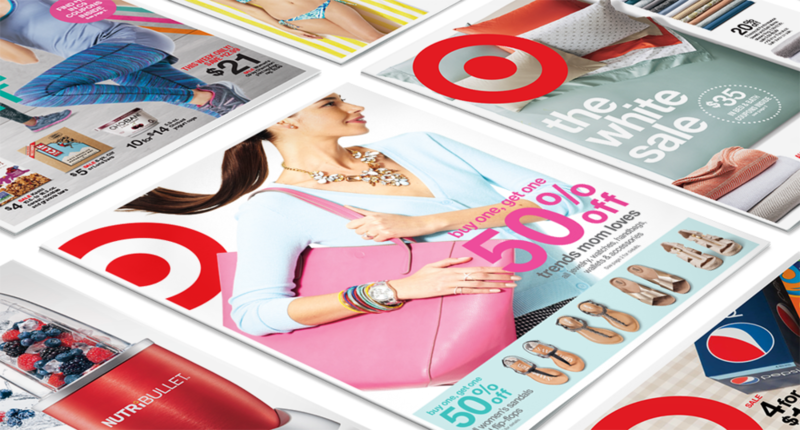 We put the Target twist on packaged goods and treat them with as much loving care as the brands would themselves. 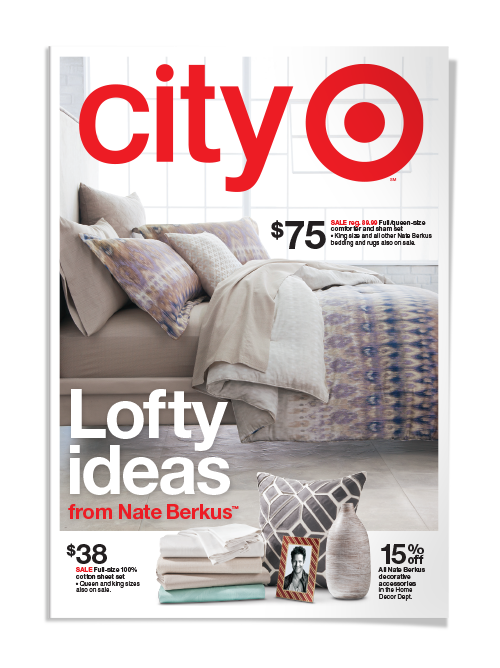 Predicting a demographic return to the city and to satisfy existing city dwellers, Target launched the smaller-format CityTarget in key urban markets. 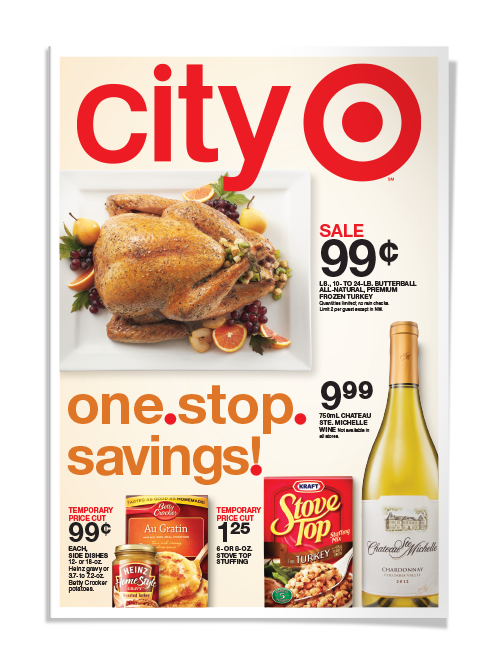 Due to its distinct assortment, CityTarget required a separate Weekly Ad. We played a key role in strategy, design and production.